Montecino & Ciaccia, P.A. 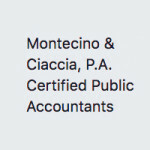 is a father-daughter CPA firm with a focus on small business QuickBooks bookkeeping, tax problem resolution and payroll services. Serving Southern New Jersey, Philadelphia area, and Delaware.